The decision to visit Dr. Du's facility near the Wall of Sleep was made - but first, Cadence wanted to ask the metal boy who'd brought back a package from it some questions. 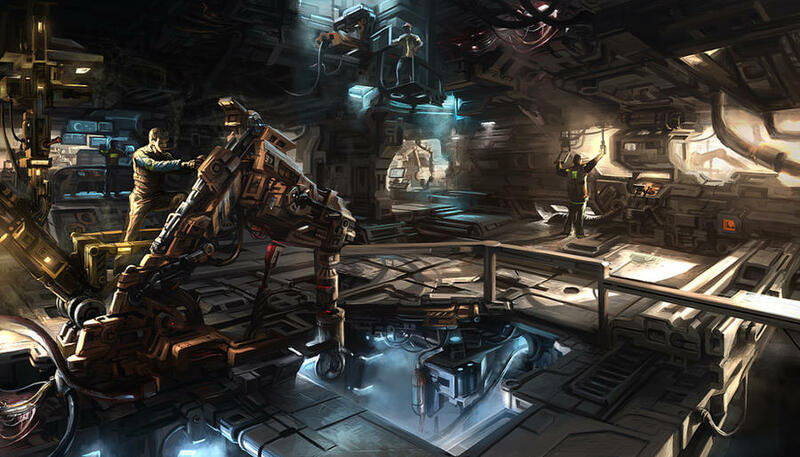 The engineering bay was a busy place - and in some ways, the heart of Grandpa's robotics lab. When things were working properly, the assembly lines that gave life to his inventions were relatively quiet, but here things were always bright and noisy, with sparks flying everywhere and a dozen yelling voices coming in over the din. Ashtar was quiet, however - he seemed to be sleeping as a diagnostics bot worked on his chest, but his eyes fluttered open as they approached. "I'm not supposed to talk much right now. Need to get some rest and relaxation," he said, grinning in a way that made clear he wasn't about to take that instruction seriously. "What are you doing here? I thought you had better things to do." "We need to know how careful you were in making sure that blackhole got to Grandpa undetected. " Sling says with a sense of giddiness just thinking about the black hole. ASHTAR's expression turned dark. "I did a good job. Grandpa doesn't send me out to hard missions expecting me to fail. But that guy really knew how to move. I've never seen anyone go through walls like him. I had to set up a false trail to lure him away before I could get on a spaceship back to Ur-Kal." His face scrunched up in concentration for a moment, as he struggled to recall something. "He was like a...like one of those special Vulpian commandos. A...what did they call them...a ninja. Yeah, a Ninja. Think the Vulpians got wind of this, maybe?" "Hey, that sounds awes-awful, and very bad. Still, you have to wonder why a lone operative, even if he was that good. Maybe it's a smaller operation than we think?" "Go through walls, you say?" Marek recalls an earlier adventure where phasing played an important role. "Was it like...this?" As Marek speaks, he activates his Ghost Field Mastery and dives through the floor and back up again in demonstration. ASHTAR's almost leaped out of his bed. "Yeah! That's exactly what he did. How did you learn that trick? ADAPA, is he a ninja too?" Suddenly, ASHTAR was looking at Marek in a whole new light, it seemed. Were a Luminian in possession of a mouth able to grin, Marek would be displaying one right now. Before he unphased, he could afford to show off a bit more. "The ways of the ninja are shrouded in mystery to all those not initiated." To properly secure the right image, he created a holographic illusion of a smokescreen around him as he slid backwards through a wall. From an entirely different part of the room, Marek's signature optical voice could be seen "...but no, I am not one of those initiates who seek to horde their knowledge, I am something much better than that. I am..."
A delicate brush of a few of Marek's tentacles slides along ASHTAR's back completes the act, as Marek returns to a corporeal form and in an optical whisper says "...a scientist!" ASHTAR's almost leaped out of his bed. "Grandpa's a scientist too. Does that mean he can go through walls and never told me?" For a moment, ASHTAR gave the matter serious consideration, but then he shook his head. "But that's not important right now. What's important is this commando could do it too. So if you know how he might've learned the trick, you should look if someone you know is behind it. I don't want to imagine what the ninja might do once he gets on our trail again..." He shivered, a strange gesture for such a brave, jaded little robot. The mission must have been quite difficult indeed if the ninja had left such an impression on him. "Whoa, that is pretty sweet," Sling responds after Marek solidifies himself again. "I assume we could split up, Cadence has that symposium and I know would like to find out more about this phase shifting." "You had something you were looking into too, right, Sling? A friend of yours? Can I help with that? I'd love to help with Grandpa's issue too, but I feel a little out of my depth with all this... sciencey stuff." "Considering the last I heard he was in Audacian space and we have to head in that direction anyway, I dont see why not." Sling replies with a sense of companionship. Cadence piped up: "It's so great to see everyone again... I don't want us to have to all split up. That's never the safe option. But... I really want to go with Dr. Rugal..."
"Its good to see you too," Sling says with a smile; oblivious to the things she said about him in her interviews. ASHTAR crossed his arms. "Grandpa told you to just send a message back to the Wall of Sleep, right? Maybe you don't need that many people for that. And if you can find something on that ninja, that'll go a long way. But whatever you do, don't waste your time. You should get going before he finds out you got your hands on the black hole and become a target." I'm going to go with Dr. Rugal. But if anything dangerous goes down, please contact me. Dr. Rugal got me this pretty bracelet that can be used to contact people from long distances, so I'll always be available!" "Sounds good," Sling says with a smile, "Hey Marek, I suppose I'll head with you as I really wan to learn about this ninja technique."